This is the spread of diffuse and spotted knapweed over the period of 1925-now. http://www.mtweed.org/Awareness/Spread/spread.html. 2. Cultural: Grasses that will not be harmed by the herbicide can by re-seeded to compete against the knapweed. Irrigation is another way to try to stabilize the knapweed and over take it. Fires are also another way of control. You can burn them down. That does not mean it will kill them though. 5. 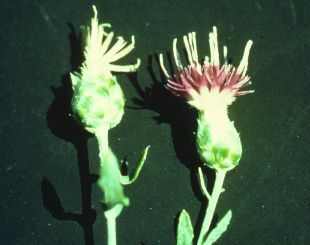 Other: Flooding or shading can also kill or destroy this knapweed. How to Prevent Spread: Some ways to stop spread are to stay out of it. Wash off your vehicle before driving off with the seeds stuck in your tires, or in the vehicle. Do not move soil infested with seeds. Basically use precautions when and if you are near or in it. (1) Rees, Norman, et. al., Ed., Biological Control of Words in the West, Western Society of Weed Science in cooperation with USDA ARS, MT Dept. of Ag., and MT State University, Color World printers, Bozeman, MT, Feb., 1996. By: Pam McKinney Published by: Pam McKinney. - Updated by: Lizzie and Markie, 3/09.